Drone Dalek Power! Scientist Dalek Power! Strategist Dalek Power! Eternal Dalek Power! Supreme Dalek Power! It's exterminatin' time! The Daleks (pronounced DAH-LEKS, with accent on both syllables) are a race of physically challenged lifeforms from the BBC One physics and cosmology documentary Doctor Who. Organisms with their origins in the Kaled race of the planet Skaro, they have no sense of pity, guilt, or common sense, and do the same thing they do every night: try to take over the universe. 16 minutes and 45 seconds of monotone shouting. The Dalek race was the result of two different sources of engineering innovation: the laboratory of the disabled Kaled scientist Davros, and the corporation simply known as Skaro Condiments. 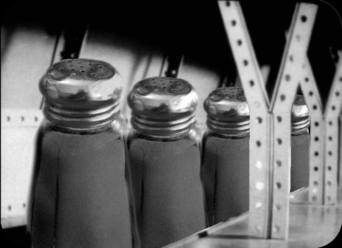 Pivotal Moments in Dalek History Nº 1: Skaro Condiments's assembly line turns out to produce abnormally large pepper pots, and with them abnormally coarse ground pepper—a novelty ingredient in Kaled cuisine for centuries to come. Skaro Condiments and Brussels Sprouts LLC, dba Skaro Condiments, was a spice company best known for its spices. Originally famous for the iconic Skaro Global Thermonuclear War Hot Sauce, Skaro Condiments abruptly decided to branch out into other markets. As it happened, salt and pepper were becoming increasingly popular and in demand as the Kaled race began to acquire a taste for food that actually tasted halfway decent, so the company chose to build salt and pepper factories throughout the planet. Unfortunately, in their haste, the company confused their metric system units with their Imperial System units—namely, centimetres with nautical miles. This disaster of catastrophic proportions produced inventories upon inventories of oversize pepper pots that nobody could even lift let alone shake for pepper. They were, however, the perfect size to encase killing machines. Unfortunately, these killing machines would not arise until Davros met the challenge of inventing them, by which time Skaro Condiments had long gone bankrupt from the sheer amount of materials needed to sustain production. Pivotal Moments in Dalek History Nº 2: Davros, in inventing the Mark I Travel Machine, demonstrates his complete ignorance of the concept of centre of mass. By the time Davros came on to the research and development scene, global thermonuclear war had erupted between the Kaleds and the Thals (following an incident at a diplomatic conference involving, ironically enough, Skaro Global Thermonuclear War Hot Sauce). Millions of soldiers were sent back from the battlefields with their bodies in wheelchairs and coffins (sometimes just their brains in jars), and the Kaled government's chief concern was to get these bodies (and brains) back to fighting the Thals as quickly as possible, even if that meant that they had to stay in their wheelchairs and coffins (and jars). The Mark I Travel Machine was based upon the conventional design of a wheelchair. Davros believed most of the unwieldy nature of the wheelchair in combat situations came from its hand-operated mechanism, which left no hands free to shoot guns or throw grenades. Therefore, Davros resolved the issue by removing the wheels. While this eliminated the issue of having to turn the wheels by hand, it also eliminated the "travelling" aspect of the Travel Machine. Pivotal Moments in Dalek History Nº 3: The Mark II Travel Machine demonstrates its capacity to exterminate 99.9% of its nemeses. The Mark II Travel Machine was a radical redesign, what with the fundamental problem of immobility plaguing the Mark I Travel Machine. Essentially the form factor was that of the modern Daleks; however, the midsection housed two robotic arms so as to enable soldiers to operate familiar and existing weaponry. This was also the first iteration of the Travel Machine in which Davros pre-programmed the urge to exterminate not only the Thals, but also all other races. However, this design too had its faults; the combination of robotic arms and urge to exterminate mostly ended in proto-Daleks reaching for the bug spray rather than for the machine guns. The Mark III Travel Machine finally succeeded, thanks to the decision to take away the robotic arms—and thus unlimited freedom—and replace them with a powerful ray gun and a toilet plunger. This was because of the original intention to separate the soldiers into combat corps and plumbing corps; however, soon enough, a sufficient number of casualties would be inflicted to create a corpse corps, and the state of plumbing in Skaro became a less pivotal issue in domestic politics. Instead, the plunger became a mêlée weapon, if a poor one at that. Regardless, this, the third iteration of the Travel Machine, was the quintessential Dalek, in that its design and thought processes made as much sense as The Fifth Element. The Daleks first saw action in the very war they were created for, the war between the Kaleds and the Thals. They successfully exterminated all Thals because they were the enemy, then successfully exterminated all Kaleds because they were built to destroy all races other than their own, then successfully exterminated all flies on the planet because the buzzing sound they made got on their nerves. Thus began the Daleks' reign of terror over the universe—the extermination of two civilisations and a lot of flies. 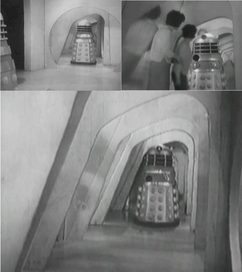 Pivotal Moments in Dalek History Nº 4: A Dalek enters a corridor in Skaro City; another Dalek stops two of the Doctor's companions in the same corridor; yet another Dalek travels down what is now clearly the only corridor left standing in Skaro City. From here, Dalek history enters the Dark Ages, largely because the Daleks were trapped in Davros's underground laboratory complex, and someone accidentally turned out the lights. A brief glimpse into that era comes in the form of the Doctor's first encounter with the monsters, which suggests that Daleks may have spent the Dark Ages chasing people around in the same corridor over and over again, presumably to entertain their tasteless and thoughtless minds. Then, out of nowhere, the Daleks emerged as a space superpower, spreading terror and chaos throughout the universe, presumably by doing the same thing they did in the Dark Ages. Even today, Dalek historians and Skarologists are baffled by the sheer speed and scale of the rise of the Dalek Empire, and the only explanation they have been able to suggest to date is that God appeared to the Daleks as a sort of vision or that perhaps they encountered God as a machine. Many theorists dismiss this theory as "a copout" and claim that such an occurrence would be utterly ludicrous. Eventually, the Daleks stretched far out enough to invade Earth, which unfortunately is the one thing that is sure to get the Doctor's attention. Since humanity is the Doctor's pretty little widget that he likes to play with, the Daleks obviously touched a deep nerve. The Daleks and the Doctor thus became nemeses, with the Daleks bent on the total annihilation of the rest of the universe, the Doctor bent on the total annihilation of the Daleks, and the flies of the universe bent on deadly vengeance against the Daleks. Pivotal Moments in Dalek History Nº 5: During a battle in the Imperial–Renegade Dalek Civil War, a Renegade Dalek takes a moment to relive the glory of his ancestors and zap some flies. When the Dalek Empire started to be beaten back by the Doctor and his friends, a faction of Daleks realised that an evil empire in their universe had as little chance as had flies against a fleet of Daleks. They revolted, and sought the total annihilation of the Imperial Daleks. The Imperial Daleks in turn sought the total annihilation of the Renegade Daleks. Therefore, the Doctor's annihilation of both factions was a huge win for everyone, except for the small detail for the Daleks that they were, in fact, ex-Daleks. Nonetheless, the surviving Daleks waged war against the Time Lords. This Time War is of very little importance, and will not be discussed except for the mention of the total destruction of the planets Gallifrey and Skaro, as well as the annihilation of almost all Daleks and Time Lords by the Doctor. Following the Time War, the surviving Daleks decided that to retaliate for what the Doctor had done to their race, they would constantly pester him by half-heartedly threatening humanity once or twice every year or so. This continued until the Daleks realised that there were only three of them left, and fled. 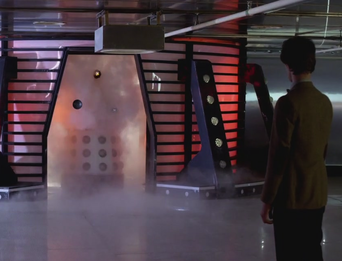 Pivotal Moments in Dalek History Nº 6: The Progenitor's smoke and fog machine strikes terror into the Doctor's hearts. Also pictured: a Dalek. The three Daleks somehow managed to convince Winston Churchill's scientists that they were human inventions—a convincing process they could not have possibly accomplished without a few dozen lobotomies—and set about restoring their race from pure Dalek DNA. In retrospect, this appears to have been a mistake. The new Daleks rise above this somehow and are now calling themselves The Mighty Morphin Dalek Rangers. Available now at your local walgreens! Collect all five colours! The anatomy and technology of Daleks may be dealt with in two parts: anatomy, and technology. 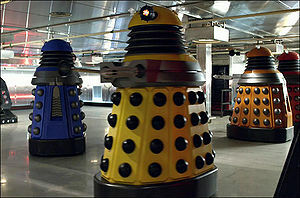 Often, Daleks are referred to as robots. 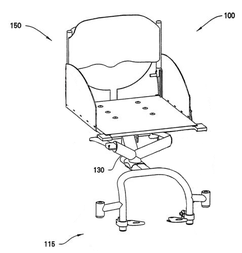 This, as we have seen, is patently false (patent actually still pending—ed. ); the extremely silly exterior—which is the part of the Dalek typically seen by humans as they point and laugh just before someone gets hurt—is actually just weaponry, battle armour, life support, transportation device, and massage chair. It would be more accurate to describe Daleks as cyborgs, albeit very comfortable and soothed ones on holiday, owing to the aforementioned massage chair functionality. Pivotal Moments in Dalek History Nº 7: A look at the Kaled mutant inside a post-Time War Dalek yields a crucial revelation: they are in some dire need of anti-aging cream. The actual Dalek being is a Kaled mutant, whose DNA began radical mutations from frequent overdoses of Skaro Global Thermonuclear War Hot Sauce. 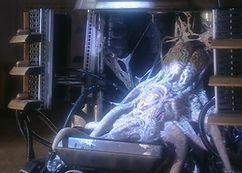 Most of the original Kaled appearance is therefore gone, except for the brain, one eye, and tentacles that the Kaleds presumably assimilated from their pet octopuses. The Kaled mutant is, of course, an utterly unremarkable creature on its own, and would not survive a swarm of vengeful flies for more than three seconds. Its augmented technology is what makes it a Dalek, a creature of chaos and shouty destruction. For instance, the Dalek casing takes over vision, speech and locomotion. The eyestalk is reminiscent of the submarine periscope in that it is equally practical and equally silly and vulnerable. The voice apparatus is actually a soundboard, with the spoken word "EX-TER-MI-NATE!" in 128 combinations of inflections, volumes, and degrees of malice. In addition, the word "OBEY!" is available in 32 different combinations of attitudes, tonal qualities, and degrees of desperation. It is a common misconception that Daleks are unable to move up or down staircases. This was true only before the Dalek Civil War, during which the Dalek Empire finally realised this flaw six thousand years after their genesis. After the Dalek Civil War, of course, the Daleks went mad and became hyperactive maniacs not just using staircases, but flying all around Canary Wharf. 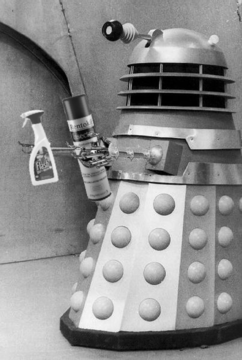 Pivotal Moments in Dalek History Nº 8: The Daleks actually evolve sensibly. Daleks are equipped with two chief tools: the gun and the plunger. 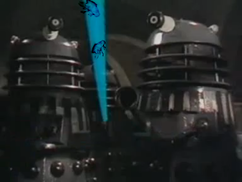 The gun obviously kills the Dalek's target by inverting the colours in its environment. The plunger, while originally developed to be a mêlée weapon, also serves as a plunger, should a team of Daleks need to take interim jobs as plumbers or escape through a pipe blocked by raw sewage. The future of the Dalek race admittedly looks grim. Their recent reversion to pure Dalek DNA has unfortunately resulted in the side effect that nobody takes them seriously any longer. Their mid-sections no longer swivel, undoing one of the coolest changes the Dalek form has ever underwent. Their repeated invasions of Earth have almost become an annual ritual, with multinational corporations and organisations like NATO and the United Nations coordinating Dalek invasion drills every spring, complete with panicking techniques and vision impairing methods. Yet, if only to spite the Doctor, the Daleks will always be preparing for next Saturday night, when they will do the same thing they do every Saturday night—try to destroytake over the universe. For those without comedic tastes, the so-called experts at Wikipedia think they have an article very remotely related to Daleks. This article has been EX-TER-MI-NATED on the front page. You can EX-TER-MI-NATE your favorite articles at Uncyclopedia:EX-TER-MI-NATE!